Home > Used Vehicles > 2016 Subaru Outback 3.6R Limited w/Eyesight,LEATHER,SUNROOF,NAVIGATION,BLUETOOTH,BACK UP CAMERA,MUCH MORE!!! 2016 Subaru Outback 3.6R Limited w/Eyesight,LEATHER,SUNROOF,NAVIGATION,BLUETOOTH,BACK UP CAMERA,MUCH MORE!!! Hurry on this one! Marked down from $30900 - you save $1450. This 2016 Subaru Outback is for sale today in Edmonton. This Subaru Outback helps you seize every free moment with drop-everything-and-go versatility, plus durability you can count on. With standard Subaru Symmetrical All-Wheel Drive, you’ll always be geared up and in control. When you want to spend more time adventuring and less time preparing, there’s no other choice. With this Outback, versatility comes standard. This coupe has 58464 kms. It's carbide grey metallic in colour. It has an automatic transmission and is powered by a 3.6L H6 24V MPFI DOHC engine. It has some remaining factory warranty for added peace of mind. Buy this vehicle now for the lowest bi-weekly payment of $192.41 with $3175 down for 84 months @ 5.99% APR O.A.C. ( taxes included, $790 Administration and Secure Ride included / Total cost of borrowing $6441 ). See dealer for details. 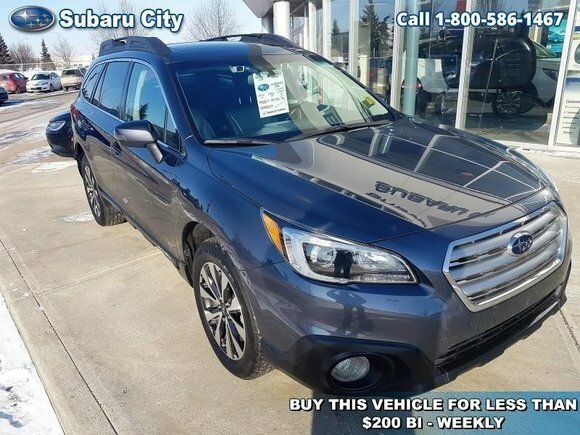 Want to try the 2016 Subaru Outback 3.6R Limited w/Eyesight?